The California temperatures have been breaking records, and we all have been trying to stay cool. The best and most common way to cool your home down in the summer is by using an air conditioner. EscrowOne, Inc. would like to show you there are other options that can significantly lower your energy bill. Air conditioners provide fast and cool relief from the summer heat, but as some studies show, it can be an environmental problem and elevate your electric bill. This summer, put high electric bills behind you and try other alternatives to minimize your cooling costs and beat the heat at the same time. 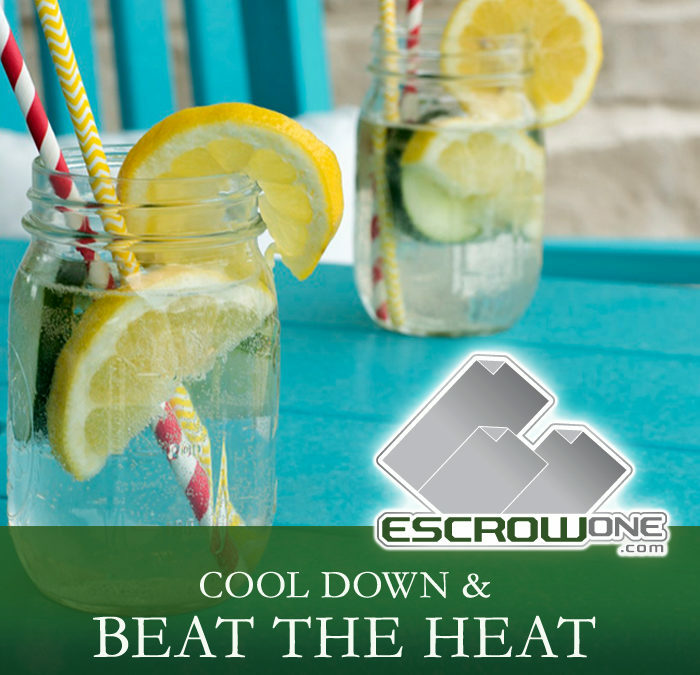 Let’s start with the outside and then move inward with some helpful tips and facts to keep your home cooler through the summer months. Paint your flat roof white or a lighter shade of color. This can keep the home much cooler underneath. On homes with tile roofs, choose lighter colored tiles rather than darker. A light tan tile will provide much more coolness rather than a dark grey color. This same theory applies to your walls. Use lighter shades of color or whites to keep the walls cooler and to reflect the sun and heat. Use trees, shrubs, and leafy plants to shade walls of your home and your air conditioning unit itself. Be sure not to block air flow to the unit, and don’t allow it to become overgrown, as it may reverse the effect of your attempt. Strategically plant trees to allow shade in the summer from morning and extremely hot afternoon sun, but allow winter sunlight to beam through to warm your home during those winter months. This will make a huge impact on allowing your walls and windows to maintain a lower temperature and keep the heat out. Again, using white or lighter shades of color on your drapes, blinds, or window shades will keep your home bright but keep the windows cooler. Reflective window shades are another great option to turn the heat away. Keeping window coverings closed when they are in the direct sunlight will greatly help to keep the sun’s heat out. This will allow your inside cooling units to work more efficiently. If you’re looking for alternative ways to beat the heat, a ceiling fan can be a great investment, making your home feel 5 to 10 degrees cooler and increasing air circulation all for less than $10 a month if you run it for the entire day. This makes it possible for you to raise your thermostat and save a bundle on air-conditioning costs. Ceiling fans are best and don’t use as much energy, but a good portable fan can be very effective as well and make a room much more comfortable. Ceiling fans in the summer months should blow in a downward airflow direction, and in the winter months they should be reversed for the most efficient use. There are several reasons and causes for the heat that generates inside of our homes. The most common source is appliances. Others are electronic or plugged in devices, and lighting. Here are some items to be aware of. Appliances- Remember the saying “give your appliances the afternoon off!” This is often forgotten and very true. Don’t run appliances in your home to create more inside heat at the hottest part of the day. The biggest contributor is your oven. Be sure your oven vent/fan is working properly to pull most of the heat generated by your oven out. Other guilty appliances are dryers and dishwashers. These also can be run early in the morning or later in the evening to maximize your energy savings. Electrical/plugged in items- Try to unplug any items you are not using. Don’t put lamps, televisions, or other heat-generating appliances next to your air-conditioning thermostat; this will create heat and cause the air conditioner to run more often and longer. The heat they produce will make it think your house is warmer than it really is, and your system will run harder than it needs to, causing your bill to rise. Lights- Keep lights off when not in use, and use energy-efficient bulbs. See efficiency usage charts at your local retailer. Showers- Try to plan showers for early in the morning and later in the evening. Steaming up your bathroom can create heat and humidity in your home, making more cooling necessary. Air cooling units do not work as well in humid climates. Also, be sure to clean your bathroom vents and ensure they are working properly.